At long last, my pallet farm table styled desk is up! 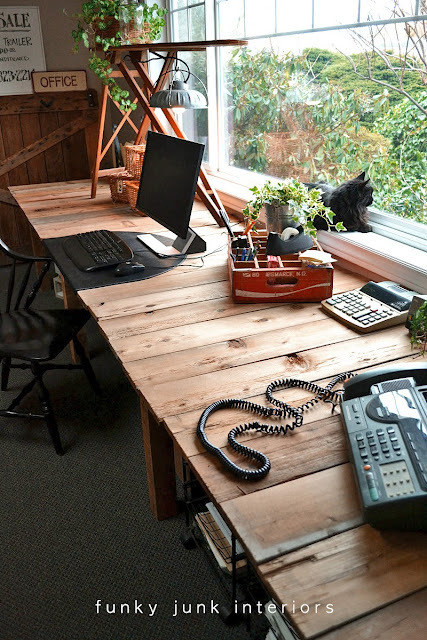 Warm woods against black accents create a pretty cozy office environment! Cedar planks for the top, pallet 4×4 oak posts for the legs, and some 4 foot chunks of reclaimed 2×4’s for the framework. The table is rock steady, not requiring additional strapping for the legs, which I was prepared to do. The heavyweight materials, massive amount of screws and sturdy framing created a very sound piece of furniture. The desk measures 12 feet long, 3 feet deep and 27.25″ from the floor, which is the perfect typing height for me. The framework just clears the rolling files perfectly! The desk was created into three sections, to allow for a sitting area in the center. Pallet stamps here and there are shown off rather than hidden, to offer up a little authentic rustic personality. Chunky wood with glorious flaws are everywhere you look. The desk truly does resemble a farm style table! This desk has a secret. The planks on top are actually sitting loose. Intending to fasten them down, the loose board trial proved the planks weren’t going anywhere. The wall holds them in place, and there isn’t enough overhang in front to flip the boards even when you lean on them. The loose boards make moving corded equipment a breeze! The planks will stay in their organic rustic state due to this north facing window being a prime area for photo shoots. The desk can be emptied at a moment’s notice to photograph all kinds of small projects nearly any time of day. While the separate planks create desktop divisions, each one is wide enough to take care of writing needs. The computer pad addresses monitor stability and mouse requirements. Since the desk was so long, it yearned for some height. A light was desired anyway, so a funky fixture was formed using a barn lamp and vintage ironing board. Pretty fun! Loosely stacked baskets offer storage with casual flair. After all, office work shouldn’t be THAT serious. And put away that office plastic, because the goods here are homespun all the way! The file holder is created from two hanging plant brackets screwed to a wood plank. It’s ample, easy to grab, unique, and free. The coke crate is perfect for all sorts of office needs, plus adds a bit of true blue vintage character and colour. A few FJI signature (fake) plants are scattered here and there to soften the edges. $3.00 for new screws. All the rest of the wood came from my neighbour’s yard, and a pallet storage area. For free. Desk – check! And I LOVE it. When I walk towards the desk, I want to sit down as quickly as possible and just soak up the warm and rustic environment. It’s so very me, right down to the last splinter. Once upon a time not long ago I use to run away from this space. Now I visit countless times a day even when I don’t really need to. This change was long overdue, however was a direct result of a power surge knocking out a work computer. The loss of the extra computer freed up the room to tighten things up and revamp the entire space. All three parts are HERE. That is amazing! And buying something that is that size brand new would cost a fortune! I love this and when I have a room big enough I will be doing this. I. LOVE. YOUR. DESK. your light is perfect hanging from the ironing board. Donna – you just slay me with your fantastically creative ideas! What’s next??? AWESOME Donna. You sure are a fast mover. Last time I looked, all you had were planks of wood and a pallet or two. Enjoy your beautiful new office space. Great job Donna! I’m using your incredible ‘new’ space as my motavation to get my office in shape. Very cool Donna! I think my favorite part is the light and how you hung it. Are you going to graffiti it up? So are you moving from the kitchen office to here now? Will give you some options upstairs with the extra space. Oh Donna ~ I just LOVE this. You did such a wonderful job and are so inspiring to all of us. I love your funky junky style. You have a real talent for decorating too, and your ‘fake’ plants faked me out. You put a lot of hard into this, and it shows! !It looks fabulous. That’s no desk, that’s a runway!! I love the massiveness of it. The lamp is adorable! It’s the second thing I noticed after the here-I-am-in-all-my-glory “desk”. So what’s happening to the old desk? I’m sorry i meant to say you put a lot of hard work into this!! You are the queen. I bow down to you. You are truly a woman who can see outside of the box..I love how you came up with the file folder..unique. That is why you got a book offer- you are a one of a kind woman- wonderful. That looks great!! Love the ironing board lamp. You mentioned “splinters”…how do you keep them away? My FIL made me a 60″ round table top out of old barn wood (2” thick, huge and heavy). Found an old base on the side of the road. I want to keep it rustic but my husband hates getting hung up on rough edges. Any suggestions? Donna it came out sooo nice! I think it came out perfectly for your funky junk style! You have a great eye! I love it! I am going to be showing this to my husband. I love it. I want to something like this for my backyard and then add really modern chairs. Do you think this type of wood can withstand being outside? Donna, the desk is marvelous, and so YOU!! So smart of you to leave boards loose to accommodate cords. 12′ of working space, how wonderful! If a person can have love for a table…then I am in love. Trying how and where to fit one in my house!!!! Excellent job! As usual, a true funky junk original! It has your name written all over it. Perfect in front of that big window, what a great spot for working or daydreaming. Love the authenticity, the way you embrace it, rather than trying to make it look like something else. It’s beautiful, functional and thrifty! Love it Donna! WOW!! I love it. Thanks for sharing. It’s simply beautiful and so very rustic. My favorite element of the whole project (other than the cost and talent behind it) it the ironing board with the lamp. My eye went right to it first thing. Did it turn out just as you had imagined it would? because it looks as fabulous has I thought it would! That came out awesome !!! You amaze me girl ! awesome! And I love that the boards are loose, what an amazing feature, your lamp is really clever too! Great job! I love this table. I’m actually thinking of fashioning one for myself. It’s beautiful and costs close to nothing. Great job. Your hard work paid off! 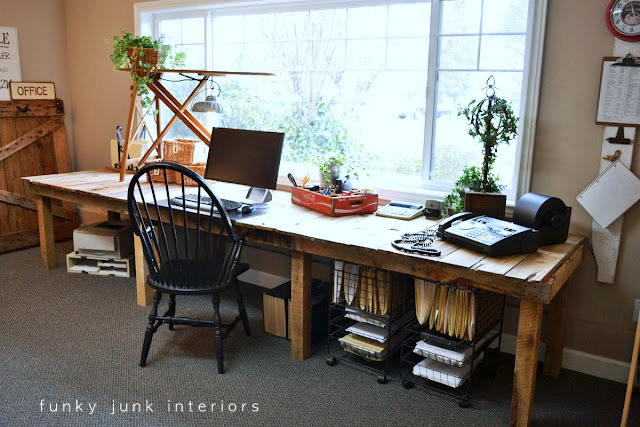 This is one AWESOME desk…I Love the ironing board on top. Perfect touch…Great Job! what an awesome work space! i was just at an auction yesterday where they sold an ironing board just like that for only a few $. i don’t have space for it tho so i let it go, but your use is so very cute! a cool statement indeed! I would have never given pallet’s a second thought in home decorating. I love everything you’ve done with them. So creative, so functional, so inexpensive. Perfect…. So much to love here! The room looks fabulous and the desk is amazing but I find I’m really drawn to all the fun accessories. The ironing board turned lamp and the file folder holder were just my kind of projects (I can only handle small projects right now….haven’t made the leap to big pieces). Have fun working in this space! Wow! That is amazing! I love it! It is an eye catcher! Love the use of the ironing board. perfect. Absolutely perfect. My favorite part :hanging a light from the bottom of the ironing board. You are a repurposeing queen! wish i had a smidgen of your talent for building! fabulous! It ALL looks fabulous. The iron board light was sooooo clever… a Funky Junk original for sure. Another amazing job, good for you. I really like the price tag on this one. I’ll take ! Do you deliver?!?!? You make me want to jump up off the couch and start making my house our home! This is great!!! My husband used the pallets that were sitting around his base while he was stationed in Iraq to make benches, tables, picnic tables, and even a surround for the port ‘o potties to make it look like an old two holer. Currently there is a pallet bench sitting in front of my house. I’ve so far been hesitant to let him make anything for inside the house, but after seeing this I might have to change my mind!!! So cozy! Love the looooong desk at that fabulous window. The kitty perch is my fav’ part! Enjoy! I simple adore that desk. The fact that you sectioned it off – so you can site in the center and use different sections for different purposes is brilliant. And, the vintage ironing board for height and light…and…and…wow. Breathe, must remember to breathe. WHERE’S THE SOUND ON THIS THING??????????????? CUZ I’M SCREAMING!!!!!! YOU ROCK!!!!!!!!! THERE HAS GOT TO BE ANOTHER WAY TO EXPRESS WHAT I WANT TO SAY!!!!!!!!! can I have a little piece of your brain? please. I’m so in love with your file holder made out of plant hangers. It’s like one of those ideas for me that is so smart and clever that I’m almost jealous that I didn’t think of it! Gosh what a great idea! I really love the Ironing board lamp. How do you come up with these things? You have a gift. That’s all. 🙂 You are truly inspirational. Congrats on another beautiful success. I love how your desk turned out. It’s a true one of a kind. The use of the barn light and antique ironing board is pure genius. As always … AMAZING! I love everything about this project, especially the fun wooden ironing table turned light/plant hanger. Beautiful! It’s great…especially the fabulously funky desk lamp!! SUPER COOL! But hands down my favorite part is the light!!! Thank-you all for your incredible kudos! I got lost attempting to email everyone so I’m building a pretty large post addressing all questions and some comments. Stay tuned! Love it…. can see something very similar going into my new office/studio that we will building this summer. Donna, your desk is wonderful….you never cease to amaze me. Your inspiration is priceless! Love your new desk and the ironing board with the hanging light is just wonderful! Your always such an inspiration with your creative mind and talent. I enjoyed looking at all your photos of your new desk. My eye was drawn to the ironing board lamp holder right off the bat. Very creative. I’m surprised your kitty isn’t laying on the ironing board for an even better view of the birds. Love it all…I’m just green with envy!!! Clever idea to put the ironing board on there too! Well done, Donna! The ironing board with the barn light is my very favorite. Maybe even my favorite thing that you have done ever. Seriously. I love it! Fabulous! Love every little detail! This is so freakin awesome, I can’t even stand it. It’s amazing and hard for me, a non-builder, to see how in the world you, a little lady, can build something like this. The ironing board…a stroke of genius, for SURE. I love love LOVE IT!!!! Have a bunch of pallets waiting for a useful purpose, will be following your tutorial and have one sweet pallet farm table when I’m done! Fabulous as always Donna. I’m in love with that light! I need 2 for some pendants in my kitchen! What an amazingly creative mind you have!!! I dream of having a desk that long with a window to match! And your coke case is brilliant as a pencil/pen holder. I love it!!! The ironing board and hanging light are perfect and I love the ivy! Donna, that room is so great now! What a desk you have built. A destination desk I’d call it. With the inviting sunlight it couldn’t be better. The lamp is my favorite accent piece. LOVE LOVE LOVE the desk, great job! Donna, I think I have looked at this post 30 times since you posted it. I have two places that I can use a table like this. I LOVE it! I hope you don’t mind me copycatting. Your style rocks. I love it, and love the file holder you made! You never cease to amaze me! Seriously. You are my ultimate FAVE blogger out there! After browsing your blog daily, I go and get busy myself. Now, that’s inspiration for ya! You have a God-given gift, my friend. The desk is great. Love how you didnt attach the top; ingenius! The file folder thingy is right up my alley. And the lamp!! Sooo gonna be copying that! Thanks for the superb ideas. Blessings!! You make pallets look good! Love the ironing board, still don’t know what to do with mine! and $3 for the whole project, this is probable setting some kind of record! Love your style! so love this…even if you had to pay for the wood, it’s a way cool table/desk! I love, love, love it! I’ve been so busy these last months that I’ve not been keeping up with blogging. What a fantastic project to come back to! Really looks terrific Donna! Your “desk lamp” is sooo clever too!! This is absolutely amazing! I think your eye in the details is Wonderful. So inspired I will be back often! GORGEOUS!!!! Donna, I love how huge, industrial and rock solid it is. I also love that is is plain wood, with just the pallet stamps … perfect authenticity. I (with everyone else) was blown away by the light/ironing board. You never use someting for it’s original use … look at your file holder…Love it!!! I know what you mean about building something that turns out fabulous … I recently built a bookcase and am working on a headboard … I feel like I can do anything now. Thanks for being a great role model. PS … sorry if I use the verb love too many times …. but really what is not to love? When I grow up, I want to be YOU!!! Is 36 already grown up??? Your sense of style and the way you arrange things is beyond incredible. You’ve got serious talent, girl! Speechless. Oh my god, lady you are good! FYI: I love your pallet desk so much it is getting a mention in my newest post over at the little old blog. Have a wonderful week! Hi Donna – Love the table. I’ve got you at the top of a wooden pallet rundown that I posted today at Blue Velvet Chair. Hopefully one day I’ll get something done with my pink pallet. Love that desk! Total inspiration for some building we’re about to do! Plan to do similar desk, I need a big desk like this one ! Oh my! That ironing board is a rockstar! You are one talented and creative woman. Hats off to you! Wow! What an incredible piece. I love that it’s in sections and the boards are loose – easy to pack & move if required. You could even rearrange it if a new space didn’t have such a great window & length! The ‘lamp’ is just miraculous! I love the idea of making weird things into lamps (I see things a lot, I have never transformed anything yet, thanks for the inspiration!). I came here from the “Roadkill Rescue” site because this is such a great idea for our Linky Party too this week. The theme is ‘Creative Final Resting Place Ideas’ this time. I’ll have to go read the rest of the story now! We’d love to host your ‘link’ there this week too! Today is the last day, hope you can join us! Completely fabulous, cheap and stylistic. Bravo! Perfect!! Lots of ideas I can use. Love the cat. Where, or where to find the rolling hanging file carts??? Thanks! You’ve so inspired me — I’ve made my dream desk and now am on to my first dining room table, thank you so much for sharing! Just gone and foraged some pellets. Next step taking care of the nails. Thanks for the great pictures and description. Awesome! Where did you find the 2 small black filling karts? 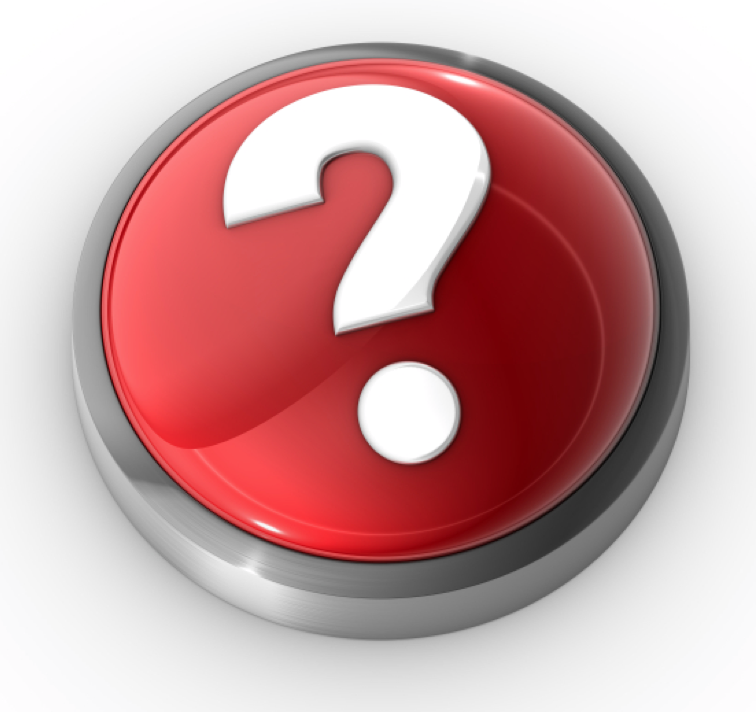 Think about the impression your office furniture has to give to clients as well as staff. Office furniture for a firm of accountants needs to be different from a graphic design company or a call centre. I’ve got to make one…got all kinds of old fence boards !!! I love the ideas you have for the old, left over wood. I love the desk. My boyfriend works in the oil wellhead industry and has all the wood pallets and wood tops from some of the containers and I’ve asked him to save them cause I wanted to try to think of some how to recycle them, but my mind seems to be fried and then I saw the desk. We are getting ready to move into a new place and I’d love to make me a desk like you have. Please keep up with the good ideas for people like me who has some of the materials, just not quite sure how to put them to good use. Donna…I love your creativity. I just transformed my den into a craft room…I need those wire carts under your farm table….can you tell me where you got those? Hey Sally! The file carts were from Costco a few years back. Maybe an office supply store would have something similar? They’re pretty awesome! So many fun ideas here. Like the ironing board light and plant stand. Really like the file holder . . . am wondering how to adapt it to hold paintings and art work. Great space you have accomplished! I love your office!! After 13+ years of selling RE I’m finally getting my own office! I have been stuck in the kitchen working around the family. We are now official empty nesters so I can actually take one of the rooms. I have the wood floors installed, it’s painted and I’m getting ready to MAKE IT MINE!! I’m calling my new office Rustic-Craftsman. Any ideas on a more secure/locking file cart??? LOVE IT! I would like one just like that – nice and long! Well done! So good looking, rustic and practical with it’s removable planks. My 12 ft outside work bench ( free from a curb ) weighs a ton. Love the little ironong board. I’ve got a little one, think I’ll stack it on top of my large wooden one. Thanks for the inspiration! Absolutely love everything! Love to make something like this myself! Hi Maria! I found these at Costco several years ago. Not sure if they still have them in stock. Hope you find some… perhaps try Ikea? Have a lot of paletts so I am going to tackle this project, love the desk !! I would love deets on how you constructed the ironing board lamp. Maybe a future post? Fantastic job as always. Hi Kristin! I seriously just hooked the barn light onto the ironing board. It would be the most boring tutorial in history. LOL The light was already built so that makes things easy. Just look for a light you love and give it a try! Thanks for the inspiration. After my work space was destroyed by Hurricane Harvey, so much stuff is being thrown away. Millions of weathered fence boards, tons of lightly damaged furniture. It makes no sense to buy a new plastic and fiberboard work station while all this other stuff is being mulched and burned. I am going to try to make a new desk from fence boards and scrap lumber! What a fabulous way to turn lemons into lemonade! I’m glad you chose this route. Your new workspace will have YOU written all over it, which in return will inspire you even more to create what you do best!